Portland, oh Portland. How I miss thee and your delectable delights. There are too many restaurants that one "must" eat at, and brunch seems to be a necessary part of the experience in that city. 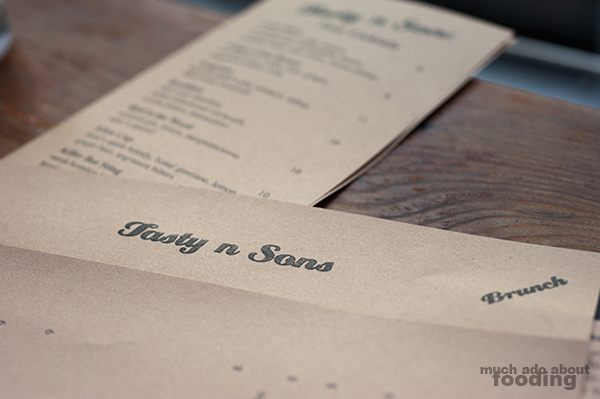 When we looked up good brunch places, the rave reviews were all about Tasty N Sons so how could we not check it out? Following recommendations to arrive early, we went a good 30 minutes prior to opening and found ourselves in a long line, barely making the cut-off for the first round of guests. Worth it? Absolutely. Perhaps we could have gotten there 45 minutes before and been one of the first seated. 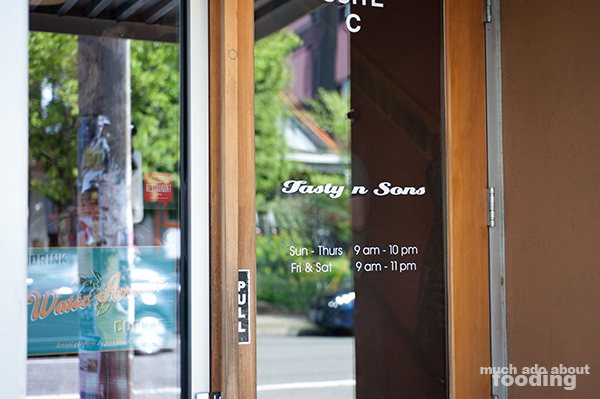 The moment the simply-decorated doors opened, the clamor began as we ascended to the restaurant from street level. Immediately every seat was filled and the noise of happy conversation lit up the room. 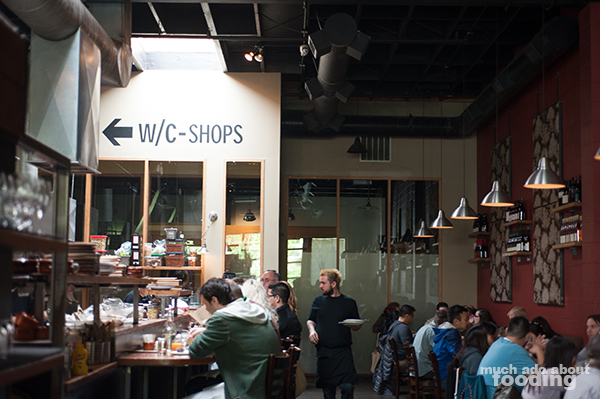 The staff was cheerful and also prepared, likely having faced this onslaught of hungry weekenders time and time again. It's what happens when your name is famous, right? While looking through the menu, I chose to sip through their Tasty Mary ($8 - Sobieski vodka, tomato, Worcestershire, horseradish, lemon, Sriracha, celery salt, celery, and house pickles), an elegant hair of the dog with plenty of flavor and kick. I particularly liked the bounteous amount of vegetables to go along with the drink and how it shied away from being overly tomato-flavored. There were plenty of other cocktail options for the morning as well. 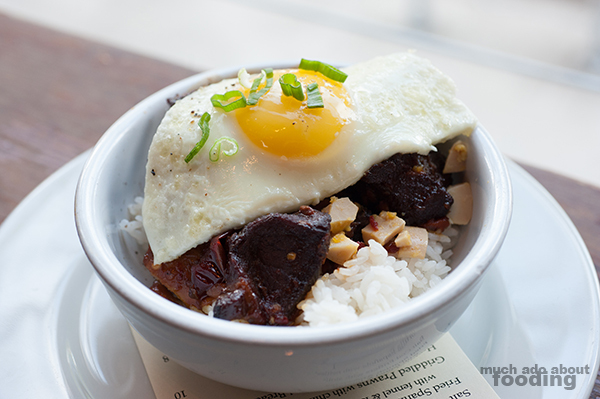 The menu veered towards the New American cuisine that a lot of new restaurants have been categorized under as serving. However, there were also several undertones of Asian influence so we decided to go with popular choices that were also a bit off the beaten path. 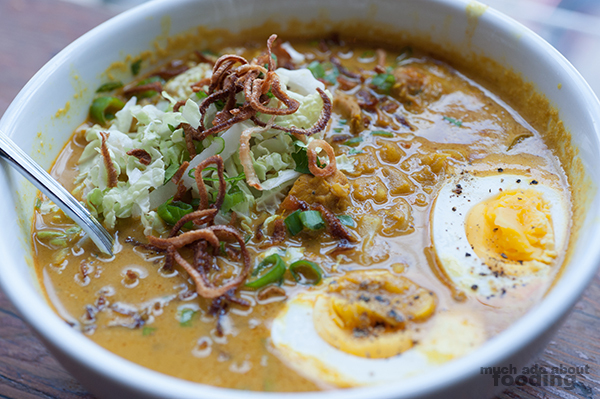 The first was the highly popular Burmese Red Pork Stew ($12 - with short grain rice and eggs two ways) which fulfilled the need for morning comfort food. 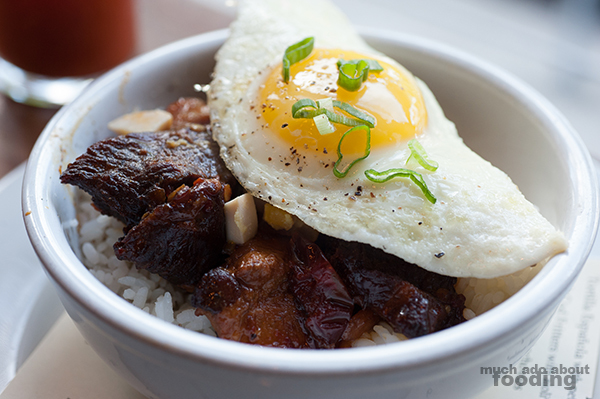 The pork was both savory and sweet, nearly caramelized in its own braised stew, and paired well with the eggs both fried with runny yolk and boiled, then chopped. I enjoyed how the meat broke away from itself with each fork touch and how the stew hugged the inside of your mouth with its sweet aftertaste. The other entree that morning was their Tasty Brunch Soup "Curry Mee" ($12 - Malaysian coconut curry noodle soup) which our waiter warned us would be spicy and even cautioned us not to order. Boy was that some sage advice that we did not heed! This particular soup set our mouths ablaze with both its temperature and the high spice level. Accentuated by the lemongrass, the heat in this dish was painful and yet undeniable due to the overall flavor in the soup. Perhaps we're wimps but at least we kept going because the soup had so many flavor layers that it was complex yet simply warming. This would be a perfect cold morning's start. 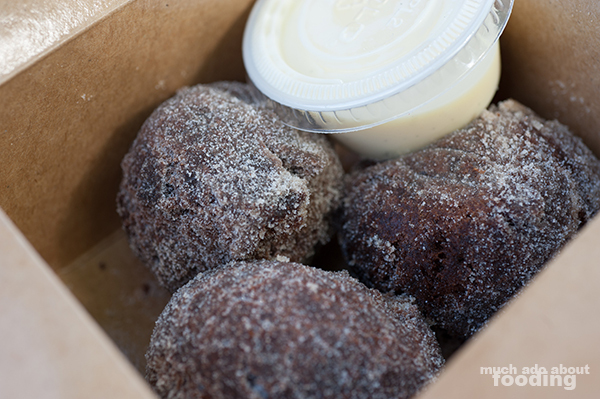 To make sure that we had covered our bases with the menu, we opted to get some dessert to go - Chocolate Potato Doughnut with Creme Anglaise at $2 each. Soft and hefty, these doughnuts had an exterior which yielded to our fingers' grasps but an interior with weight. There was just the right amount of sugar dusted on each mound, and the creme was not necessary but welcomed. For $2 apiece, the morsels are worth it but only if you are a chocolate lover as the flavor can be as weighty as the cakeyness. 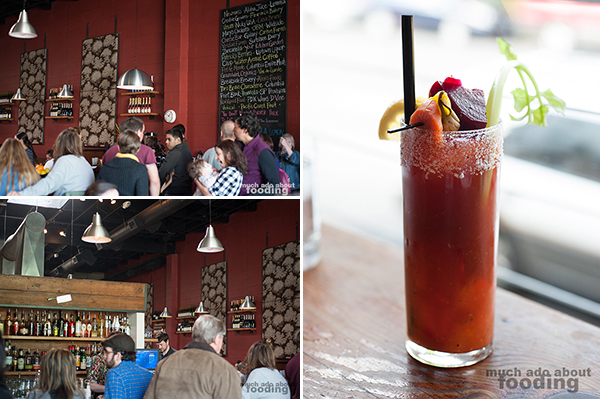 Overall, a great place for brunch and certainly one that the community believes is worth the wait for too!